As a web developer of 20 years experience I do sometimes get frustrated by other web developers’ efforts. Especially when I know they are working to much higher budgets than me and on much more high profile projects, but still get it so very wrong. Recently, something that has been driving me mad has been broken “feedback” forms. If you ask me for feedback, at least have the decency to have a feedback form that works – or what happens is that we go recursive (or at least re-entrant) as I try to give feedback on the feedback form only to find it fails! Today I was asked to give feedback on my recent visit to a tyre fitter in a “2 minute survey”. No problem, I always go to the same one because the service is great. So I fill in the form (less than 2 minutes) and hit submit. 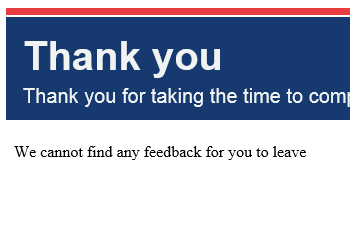 “Thank You” the web page says, “We cannot find any feedback for you to leave”. Yesterday I was providing feedback to Samsung. I had filled in their email form the day before only to be told it had gone to the USA and I needed to contact the UK so had to start again – oh and by the way, we wont send you a copy of your submission so you better go find all the details you need again. So I did, I found all the bits I needed, retyped the whole thing, worked out what products I had to select from their compulsory drop-downs (that didn’t contain my product) and hit submit. “Tried to send data without session” – well that’s informative and helpful. Basically it would not send at all. So I clicked on the “Customer Satisfaction” link. Guess what … it didn’t pop-up the promised pop-up form. It did nothing. Add to this a liberal sprinkling of “Click here to contact us” links that simply 404 or go back to the homepage. “Click for more information” links that provide “Oops, sorry, this page has moved” (yes, even the likes of Google and Microsoft manage this one) and you begin to see my frustration. I bought some clothing from All Saints for my wife’s birthday. Great website. After the purchase it said “Provide us with some feedback” and I was so pleased with their process I decided to. Only the feedback form failed. So I tweeted them to suggest they check. “Sorry you had a bad experience”, no, I had a good experience, just a bad one telling you. “Please DM your number and someone will get back to you today” … needless to say, no one ever did. There have been others, but they are just differing versions of the same sad stories. Feedback forms are not tricky, surveys can be but there’s plenty of reliable software out there. If you get this wrong, who is going to have faith in your more complex processes. Like on-line purchases. Please people, get your websites checked by an independent checker and provide a more direct method of reporting issues … it really is not rocket science!